Long Now’s 10,000 Year Clock will tell time not in hours and minutes, but by keeping track of the astronomical cycles underlying those units. We can’t predict how the calendar and timing systems will change over the next 10,000 years, but we know they’re likely to be built on top of the very same things we’ve built our system on: the rotation of the earth, the cycles of the moon, and the ebb and flow of light and dark throughout the years’ seasons. For most of human history, time wasn’t a matter of digits ticking by, but rather a complex interplay of these overlapping rhythms. 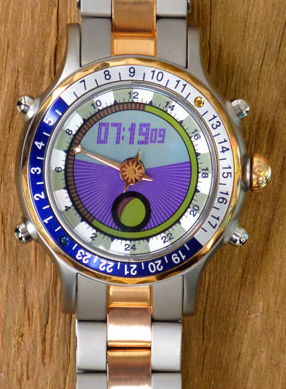 The makers of YES watches seem to similarly appreciate this long-view of time-keeping. Into thoroughly modern digital timepieces with all the standard functionality you’d expect in a digital watch, they’ve incorporated a taste of our deep history with the sky. YES watches feature an analogue hour hand that rotates once each day, indicating along its way the rising and setting of the sun and moon. It’s because of this resonance that we’ve carried them for years now in our Museum & Store in San Francisco, but between now and Father’s Day, Yes is also giving Long Now a 20% commission on each watch bought online through this link: www.yeswatch.com/longnow For Father’s Day, they’ve created a new style of watch with two 24-hour bezels. Bjorn Kartomten is the brains behind this innovative design. He worked with a global team of manufacturers to realize his idea of making a watch that tells modern time along side the cycles of the sun and moon. The hand movement is made in Switzerland, the sapphire crystal in Germany and the chip is made in Japan. The Yes Watches are used by film directors, photographers, adventurers and more – anyone who would like to to have an accurate understanding of the day and night’s natural cycles.